Not a Panda or an ant. 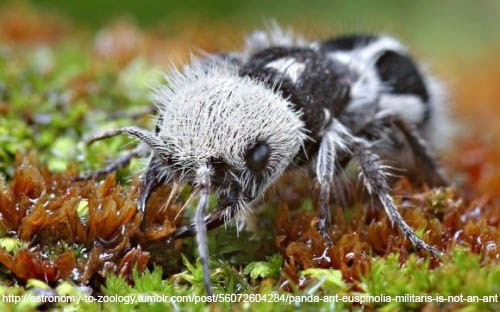 Euspinolia militaris is commonly known as a Panda ant, because it looks like a Panda. And an ant. Actually it isn't either. They are a type of velvet ant (see Classification). The dense layer of fuzzy setae is a common feature in the velvet ant family. In this species the color pattern happens to resemble the color patterns in a Panda. The Panda ant is endemic to Chile. 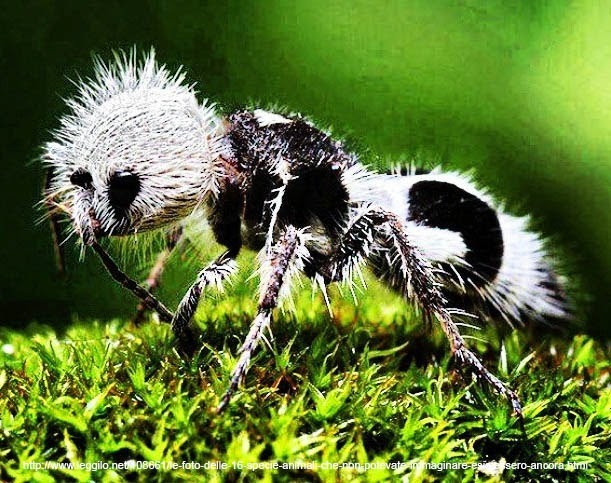 Panda ants are not true ants but belong to a family called Velvet ants (Multillidae). They are in the same Order, Suborder and Superfamily as true ants (Formicidae), but are not the closest relatives to them. There are many winged wasps which are closer relatives of the true ants. You can call them a wingless wasp, although technically true ants are also a type of wasp. The common name Panda ant is sometimes used to refer to other members of thr family Multillidae.